I have the same problem.the txid cannot be found on the block exploer.I am waitting for a response of poloneix.Anyone has any news can discuss with us. @chen96My problem is that the withdrawal is complete but not received. There is a txid that is fake, no query, and the same problem solved? 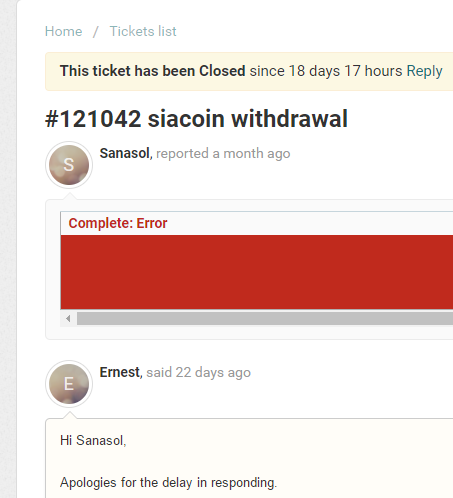 @kong112 many people face the same problem .The amin said will be sloved in this week.how knows.my ticket no response over 11 days.so you can see how slow the poloniex do. The wallet is fixed.Is anyone's SC back? no one reply this.all of yor SC is back ? @chen96 nope. txid still now showing in explorer but its completed for polo. Also been waiting for 14 days due to a complete:error issue. No response from support and the troll box mods are less then useless. I wanted to tell you that today I withdrawal from Poloniex Sia Coins and it took me less than 10 minutes to get it in to my wallet. I am really anxious about the coins. Same problem. Yeah, I get that Poloniex are 'overwhelmed' with support tickets, but really, exchanges shouldn't be able to get away with such sloppy customer liaison. Are you not able to contact Poloneix find out what exactly is the issue?? I have the same problem. I entered a support ticket 11 days and 16 hours ago. No response. I'm starting to think this is a losing battle.